This position is funded by Canada Summer Jobs. To be eligible for this position you will need to be between 15 and 30 years of age. You will also need to be a Canadian citizen, a permanent resident or a refugee and be legally entitled to work in the employer’s jurisdiction. There are two full-time positions. The below list of job tasks will be delegated to one of two job positions. -Assist with scheduling, facilitating community-organized creative public placemaking projects. -Face-to-face, telephone, letters and email communication with artists, residents and other related parties of the festival. -Engage businesses, organizations and community residents in creative activities through out the community. -Support businesses, organizations and community residents in the production of their community-led creative projects. -Support team in creative brainstorming and implementation. -Be comfortable speaking with strangers through grass-roots community activation methods. -Assess situations and identify problems; be creative and innovative in exploring possible solutions; check to see if a solution works; and act on opportunities for improvement. -Initiate a community-based project that meets the criteria for this community festival. -Support community residents in developing, designing and mobilizing community to produce a number of interaction murals through out the summer. -Work with our low-income and seniors populations to develop community-based art and performance work with the intention of public viewing and celebration. -Support a committee of residents engaging in creative placemaking projects throughout the neighbourhood. -Provide administrative support to this committee where needed. -Work with Stamped Breakfast Committee to coordinate our annual pancake breakfast. -Work with the Engagement Coordinator to develop a engagement activity for the event. -Shadow the Community Engagement Coordinator in community advocacy work they are doing with the municipal government. -Support, where and when necessary, the goals of these two initiatives. -Develop and post social media content based on the established social media strategy. -Learn to write press releases and post to event pages. -Continuously update community asset map and website. -Meet the requirements of the Canada Summer Jobs program. -Passionate and committed to building a healthy, vibrant, sustainable community. -Minimum completed post-secondary or current post-secondary student. -Self-motivated and demonstrates the capacity for, both, self-directed/team work, and be able to work well under minimal supervision. -Strong interpersonal and communication skills. -Have experience with social media marketing. -Have excellent written and verbal communication skills. -Be highly responsible, mature, and willing to accept personal accountability. -Have an enthusiastic and positive attitude. -Must own your own computer with word processing, spreadsheets, e-mail and internet (and possibly, but not required, Adobe suite) applications. -Excellent written and speaking communication in Cantonese, Mandarin and French. -Have excellent layout and graphic design skills and experience using Adobe creative programs. -Experience writing materials such as blog posts, social media posts, or creative work. -Experience managing social networks for brands / organizations. -Experience with festivals and special events. -Experience with sound and lighting equipment. -Experience with community grassroots organizing. -Experience in marketing or communications skills or experience. The Community Engagement Assistant / Events Coordinator will report to and work directly under the supervision of the Community Programs & Engagement Coordinator. The candidate, in collaboration with the Community Programs & Engagement Coordinator, will establish a mentorship and goal orientation based on the candidates desired job-career goals. In this position, candidates will learn about community engagement, creative placemaking and community-focused event coordinating. The Engagement Coordinator Assistant will meet, at least once a week, with the Engagement Coordinator and, monthly, with the Engagement Committee, to determine weekly and long-term deliverables. The Engagement Committee will be comprised of the Engagement Coordinator, Crescent Heights resident volunteers and additional CHCA Board members. Additional supervision and guidance will be made available through the Crescent Heights Board of Directors if need be. In the first week the student will be introduced to the team and be taken through workplace orientation and onboarding by the supervisor. In week two, job-career goals will be agreed upon by the supervisor and the student. The supervisor will have daily contact with the student, bringing them into team problem-solving and decision-making meetings. Through out the 16 week work schedule, the supervisor will hold weekly check-ins to coordinate weekly and long term goals and project deliverables. At the end of the project, the supervisor will conduct a formal performance evaluation with the student and will provide him/her with a written report. As an employee, the student is covered under our liability insurance. 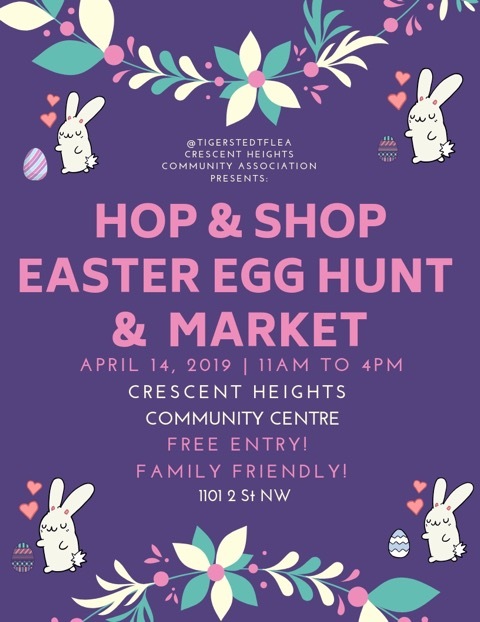 Join the Community Association and Tigerstedt Market this April 14 for a fun Family Friendly Easter Egg Hunt and Market! There will be a clothing swap (bring your clothes that you want to trade, anything left over will be donated), Easter-egg hunt (find the bunnies for discounts), and a mini market showcasing the talents of Calgary artists and entrepreneurs.